I have been wanting a new pair of rain boots ever since I moved to Seattle, well over three years ago. I have tried on pairs here and there, but never found a pair that fit my calves (yoga & mini tramp have made them a bit too muscular for normal boots) and also were comfortable. Not to mention they had to look cute. After the recent heavy rains, with my KEEN Amsterdam shoes just not keeping my feet dry enough when trying to forge the river at 1st & Battery, I decided I was buying a pair of rain boots ASAP. I searched a few websites and came across a few boots I wanted to try on. I especially liked the Chooka Rain Boot. 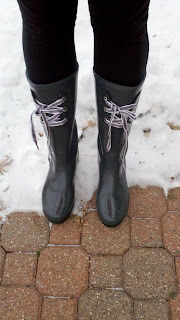 So, I decided to walk to Nordstrom (in the rain) and try on every pair of boots I could find. Well, the Chooka boots didn't fit, the Kamik boots were cute but felt weird, the Hunter boots made me look like I just got off the halibut boat and the Steve Madden boots were just a bit too odd for me. Anyway, I left that day without boots and flew to Michigan the next day. Literally, during my flight, a winter storm had hit the area and 4 inches of snow dropped during my 4 hour flight. Then another 10 dropped later that evening (schools were even closed.) As soon as the roads cleared, I asked my mom (yeah, it's like I'm 16 when I come home) to take me to the mall and I wanted boots! I walk into Nordstrom again and the Novi, Michigan store has rain boots on sale, and a lot of them. The store was less picked over than my normal Seattle location, probably due to less of a rain boot demand here in the Mitten, oh yeah and that whole Michigan economy thing. I am SO happy with this purchase. I've literally been wearing these three days straight. First, they are comfortable!! I feel like both my foot and ankle are supported and the do not hurt my feet at all. I feel like I am walking on my own cushion. In addition, I love that the heel gives me a bit of height. I have been trekking around in 5-6 inches of snow without a problem and my foot has stayed warm and dry!! 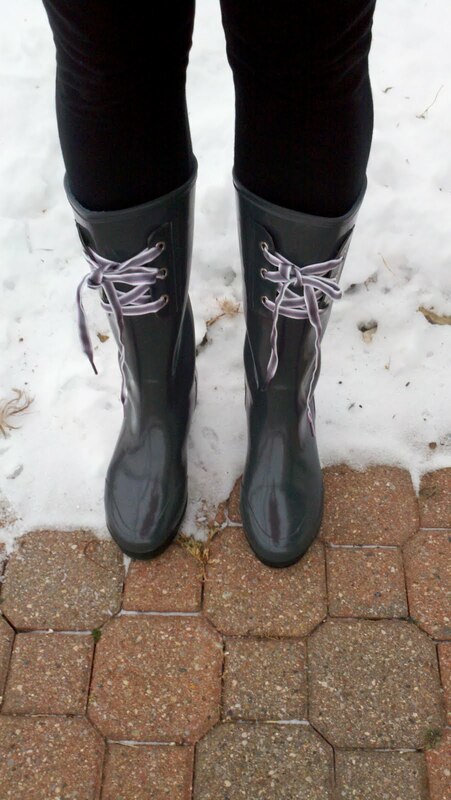 These boots actually make me look forward to stomping through puddles and slush. The boots are on sale at Nordstrom for $60 right now (originally $80) or Amazon for $63. I highly recommend.